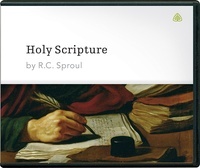 Dr. Sproul explains that mainline Protestant denominations have confessions or creeds that provide definitions of what they believe about the Bible and other essential matters of the faith. For the most part, these creeds were hammered out during times of great controversy in the church and are the result of intense study by history’s most learned Biblical scholars. R.C. uses the Westminster Confession of Faith as his springboard to examine basic questions about the doctrine of Scripture. He says that the purpose of Holy Scripture is to help believers better understand this doctrine and thereby renew their minds and lives more fully for Christ.